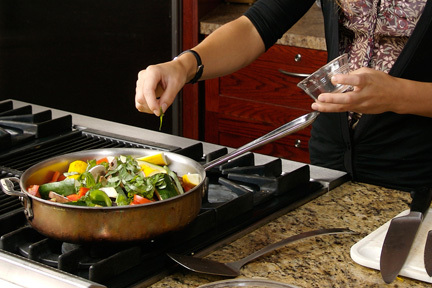 Here’s an easy way to cut down on indoor pollution created in your kitchen. Do as much stovetop cooking as possible on your back burners. Why? Because most exhaust fans extend over the back half of the stovetop, but a lot of them completely miss the front ones, and the hot air from the pans rises in a column directly above each burner. So, if you use the back burners, your exhaust fan will remove twice as much smoke, soot and pollutants.